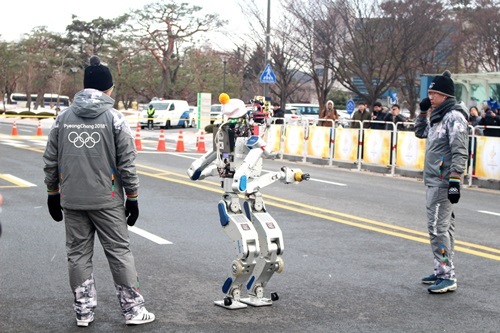 Prof. Junho Oh of KAIST passing the Olympic torch to the human-operated FX-2. 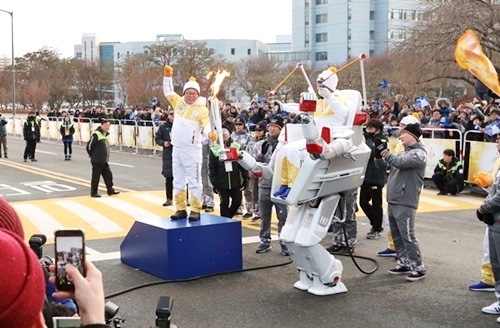 Korea’s humanoid robot Hubo and human-operated robot FX-2 carried the PyeongChang 2018 Olympic torch. The two robots received the torch from their creators: KAIST’s Professor Junho Oh and UCLA’s Professor Dennis Hong. The Olympic Torch Relay event, held in Daedeok Innopolis on December 11, drew a large crowd despite the snowy weather. Based on the theme of ICT, the Olympic Torch Relay took place at KAIST. A crowd of spectators gathered near the KAIST Bridge about thirty minutes before the start of the event. Dennis Hong, a world-renowned robotics professor from UCLA, attended the event as a special torchbearer. He rode in a vehicle driven by Hubo and alighted at the main entrance of KAIST, and then passed the torch to DRC-Hubo. Before receiving the torch, Hubo performed a disaster rescue operation in front of the duck pond. Developed by Professor Junho Oh’s team, Hubo gained worldwide recognition after winning the 2015 DARPA Robotics Challenge. On this day, Hubo also succeeded in cutting a hole through a wall. During the demonstration, the robot nearly fell back due to a brief interruption in wireless communication. The crowd grew anxious at the delay, but burst into cheers when the robot eventually broke through the wall. The torch was passed smoothly from Hubo to Professor Junho Oh, and again from the professor to FX-2. 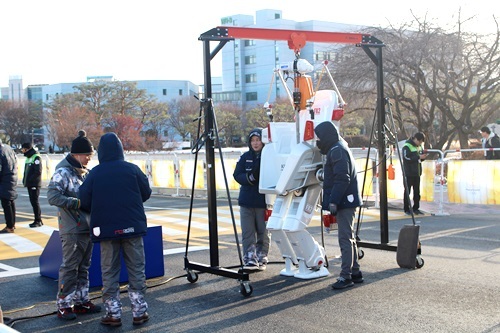 The human-operated robot FX-2 was presented to the public for the first time. It was operated by Jeongjae Lee, the student representative of the leading team (Jeongjae Lee, Donguk Kim, Dabin Kang Dongha Lee) of the Junior Software Cup. A quick inspection of Hubo before the torch relay. A public demonstration by the human-operated robot FX-2.